It was the last night for the OneWorld Health medical outreach team in Masindi, Uganda. To celebrate, the hotel arranged for a local dance team to demonstrate some of the local tribal dances and music. Shell covered hips and legs provided a gentle shushing noise while the clapping and stomping created a more clearly defined rhythm. Grass skirts accentuated hip movements so that a simple shifting of weight created a rapid and wild swing of the skirt, capturing the audience’s attention. Auditory and visual stimulation merged into one. It was a far cry from the ballet and tap routines I had grown up trying to master in small town West Virginia. I was simultaneously filled with the desire to join this mass of bodies and movement while also overwhelmed by the strange and different nature of the dance patterns. Then they asked for volunteers. One of my comrades bravely stepped forward and he was graciously received. They gently draped a grass skirt around his hips and began directing him in the most basic of movements. More and more volunteers added to the dancing mass until finally I could no longer resist the urge. My curiosity outweighed my fears of embarrassing myself and I stood up and allowed myself to be drawn into the madness. Rapidly we danced in circles and I focused intently on mimicking my partner’s moves exactly. In my mind it was like a scene from Footloose, Ugandan style. And then we were done. The music stopped. Now the sound of heavy breathing and sweat permeated the open area. Some serious dancing had been done. I prepared myself for them to be impressed. I knew I had danced my little heart out. They asked for a photo to be taken with me. I imagined it was because they didn’t know an American could dance like that. Then… they said it, “Thank you for trying.” Not, “What incredible dancing legs you have!,” or “ Please come back and dance with us again.” It was like the Ugandan version of the “Heart and Hustle Award.” There was no indication I had done any decent dancing at all, just appreciation for an honest effort. After laughing about the event numerous times with my team, I began to think a little more about the whole experience and how I felt that it applied on a greater scale to the realm of humanitarian aid. When humanitarian aid first came in vogue, aid workers were glorified. They were treated and received like saviors. As time progressed, and people began to evaluate the repercussions of some of these aid attempts, books like “When Helping Hurts” drew attention to the reality and severity of the situation. Good intentions are not enough to stop bad things from happening. We must educate ourselves and allow the communities where we are working to help determine the mode and means of intervention. As result of this conundrum, many people have begun to shy away from the idea of short-term trips or medical outreach in general. However, as this pendulum swings, first towards focusing on the purity of the acts and then on the imperfections, I believe that our approach and the subsequent dialogue surrounding these aid attempts needs to lie somewhere in the middle. While we must always strive to make our programs better we must also not allow ourselves to be incapacitated by the fear of failure. I am concerned that in a society where we are conditioned to measure quantitative data and measure success purely by objective calculations, we can find ourselves hesitating and missing opportunities as we pursue guaranteed success. If you want to dance, you must first step out onto the dance floor. My dancing was severely lacking. I am now aware of that. My hope is that it will at least be slightly better the next time I return. With each attempt I will continue to make an effort to improve. I understand that we cannot be this laissez faire when dealing with human lives. The truth is that some individuals are still dealing with the repercussions of other people’s good intentions from fifty years ago. As a result, I fully believe that you should heavily research any team that you are considering joining. Study the pertinent historical aspects of the country you will be traveling to. It is impossible to know the mountain range until you understand which tectonic plates set things in motion long ago. Be prepared for poverty and devastation like many have never seen. But in the end, remember that it is impossible to steer a vehicle if it isn’t moving and so your first action must be to move. Step out and go. After you have gone, when you are compiling all of your information for a retrospective analysis of the trip, remember that whether your objectively measured quantitative data calls it a success or not, those people who you took a chance on will absolutely look at you, know that you considered them valuable and worthy and they will say, “Thank you for trying.” Some would argue that this is not enough. I would agree that if we allow this brief “thank you” to be the final end goal then it is wholly inadequate. But ultimately, I believe that the first step towards becoming a participant in the world around us is actively and intentionally stepping into the lives of the people we want to help. That relationship has to start somewhere and I believe that if you can come each day and say to people “Your life is equal to my own and I am going to do what I can today to show you that,” then there is something small in that very moment which is being accomplished. Screaming loudly, “The system is broken!” will not fix the problem, nor will pretending that the brokenness isn’t there. If our options are anger, apathy or active participation then I think there is only one logical conclusion ,even if this means accepting that our participation will not be perfect. Walk onto the dance floor with what you have, knowing that it will not be enough, and for the time being, find a way to make yourself okay with it. It’s early morning and the emergency room is finally quiet, having settled from the shuffling chaos of illness and injury that the daylight hours inevitably bring. A car screeches to a stop in front of the main entrance and the charge nurse yells for the physician on duty to come to the resuscitation bay. A young, pale woman in her mid-twenties lies on the stretcher sweating and writhing in pain. It takes only a few minutes for the emergency room physician to ascertain that the young women is suffering from a ruptured tubal pregnancy and is near death from internal bleeding. She needs an immediate life-saving blood transfusion, but the blood bank is empty. There is no blood. The patient is taken to surgery but dies shortly after. This scenario does not occur in the United States due to the 9.5 million individuals who donate blood in this country each year. Unfortunately, it is an all too common occurrence in many developing countries. According to the World Health Organization, only 40% of blood that is donated each year is collected in developing countries, however, these countries represent 80% of the world’s population. The situation is particularly dire in Sub-Saharan Africa where the HIV crisis makes suitable blood donors difficult to find. In addition, testing for many blood-borne infections that can be passed through transfusion are not available in many low-income countries, leaving those who do receive blood transfusions vulnerable to contracting HIV or Hepatitis. Global health funding has largely neglected transfusion services. Lack of publicity and difficulty defining the scope of the problem are likely major reasons this issue has remained greatly overlooked. Most of the major areas of global health funding from the United States government is channeled toward HIV, malaria, tuberculosis, child and maternal health, family planning, and sanitation. Many would argue that global health dollars are better spent addressing these global health targets than recruiting blood donors and investing in expensive laboratory equipment for better blood testing. But there is a critical and understated link between improving blood transfusion services and decreasing morbidity and mortality from at least half of these global health targets. As children suffering from malaria-related anemia and mothers with post-partum bleeding represent the most common recipients of blood transfusion in Sub-Saharan Africa, investing in child and maternal health means investing in better transfusion services. Several African countries have greatly improved their available blood supply through simple cost-effective donor recruitment campaigns aimed toward recruiting young donors at low risk for HIV and other transfusion transmittable diseases. Groups such as Zimbabwe’s Club 25 encourage secondary school students to donate blood at least 25 times in their lifetime and have been quite successful. Organizations, such as The Safe Blood for Africa Foundation, assist African countries in developing national transfusion services and improving blood testing, collection, and distributing blood products. Safe Blood for Africa does receive multiple grants from USAID, but certainly more federal government dollars and more organizations like this one are needed to make a significant impact on this massive problem. About 10 years ago, I met a young South African in her mid-twenties. I was a fourth year medical student on an elective rotation in rural South Africa and she was bleeding to death. And although I do not remember her name, she changed the trajectory of my life. She was not my first patient to die, but hers was the first death I couldn’t live with. Her death was stupid and preventable and unfair. She changed the way I saw the world and planted a seed of anger that grew into a passion for global health. So, to prevent another stupid, preventable, unfair death; I ask you to consider donating blood and supporting your local red cross. Contact your legislative representative and ask them to support funding for a safe and adequate blood supply in Africa. Be thankful for a blood bank that might run low, but never runs empty. And remember those who might find themselves in a different situation, in a quiet emergency room, in the middle of the night, saying goodbye to a loved one because the blood bank in their country is bankrupt. George passes the chart for me to review. There are two plain white pieces of legal paper stapled together with a short note scribbled in blue ink. “34 year old with four days of weakness. Fever and vomiting. Feels cold. No medical problems suspect malaria.” Below the note, orders for five medications are written – an antibiotic, antimalarial medication, a steroid, and two medications for stomach ulcers. The note was written two days ago. I ask George why a steroid was ordered, but he doesn’t know. The patient is thin and pale as she looks up at me from the hospital bed, her child sitting quietly on the floor next to her. A clinical officer initially evaluated her in the outpatient department, wrote the initial orders, and admitted her. Clinical officers have two years of formal medical training and are similar in equivalency to physician’s assistants in the United States. No one saw the patient on rounds yesterday and she has not seen a physician since she came to the hospital. George leans over the patient and says something to her in Swahili. She doesn’t understand. George is a clinical officer employeed at the government district hospital but he is not from this area of Uganda and doesn’t speak the local language. We moved down the long line of patients, one by one. An elderly lady with an acute stroke did not respond to Lasix well to treat her high blood pressure. Her blood pressure was dangerously low two days ago when she was seen on rounds. At that time, the medication was stopped and she was given a bolus of IV fluids. Her blood pressure has not been checked since. George inflates the blood pressure cuff and listens intently with his stethoscope pressed to her upper arm. Luckily, her blood pressure has improved today. We move on to the next patient, a young woman badly beaten by her husband five days ago. She complains of abdominal pain. A complete blood count had been ordered but has not been done, the machine in the lab is broken again. George presses on the patient’s abdomen as she winces in pain. He decides to send her to another medical center to get an ultrasound. The ultrasound and xray machine at the hospital have been broken for weeks. We review the patient’s orders. George asks if the pain medication has been helping. She states she hasn’t been given any medications since she arrived yesterday evening. Dr. Kayumba joins us, finally free from an emergency c-section case in the operating theater. We move on to the next patient. The visiting team from Masindi Kitara Medical Center with Dr. Kayumba and one of the staff nurses from Masindi District Hospital. This is how I spent my morning at the district hospital in Masindi, Uganda. It has been a few years since I had visited an African district hospital. I have been spoiled by NGO sponsored hospitals that boast modest but available staff and supplies and had forgotten how dismal the conditions can be (and usually are) in the district hospitals. Broken equipment, drug shortages, and inconsistent training frustrates the already overburdened and poorly staffed health care providers. Physicians and nurses choose their occupation based on a desire to help, to take action, to intervene. Instead, these providers are forced to stand by and watch as patients die of curable diseases for which they have the knowledge, but not the ability to treat. Their hands are tied. There is nothing more frustrating. Expect, possibly, knowing that they will most likely one day be patients in the same system, helplessly stuck and powerless. 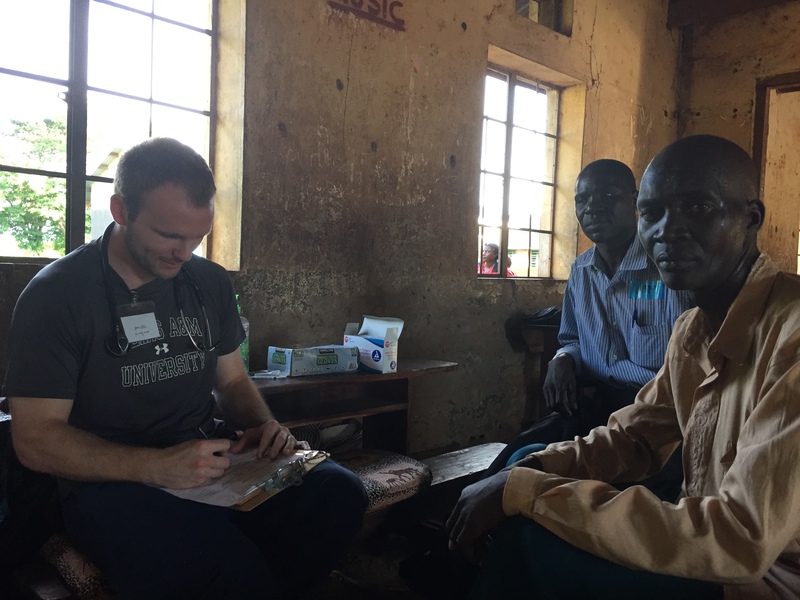 Dr. Luke Husby evaluating a patient in a mobile clinic in rural Uganda. Palmetto Health Emergency Medicine Residents are finding that the skills they have learned during their residency in Columbia are making lasting impacts across the globe. The EM department has 13 residents participating in global health trips during the 2015-2016 academic year which are as varied as teaching emergency medicine to physicians in India, treating patients in mobile clinics in Tonga and Nicaragua, training Tanzanian physicians to use bedside ultrasound, and managing emergencies in Haiti’s only critical care hospital. 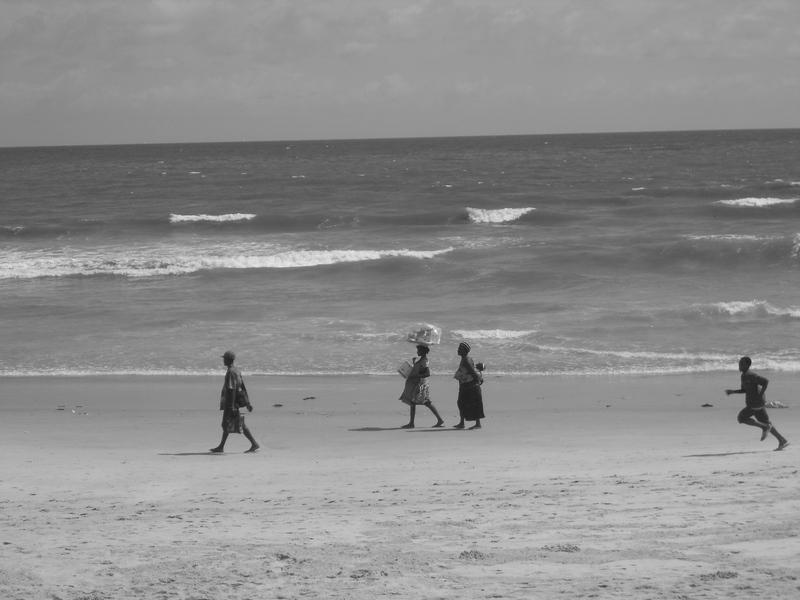 As global health opportunities such as these become increasing available, more of our residents are participating, even if it means they are using their vacation time to do so. Nearly all of the EM residents are participating in some type of global health experience during their residency with increasing movement towards longer term, sustainable activities. The EM department is also forging partnerships with hospitals in rural Uganda and Tanzania to improve patient care and knowledge exchange. Global health electives provide residents with exposure to disease pathology rarely seen in the US and experience practicing medicine in resource constrained environments. As one of our recent graduates Dr. Jo Innes noted, treating the same condition in Haiti and the US varies greatly, but not necessarily the outcome. “A patient in acute on chronic CHF didn’t get an EKG, chest x-ray, CBC, BMP, BNP, troponin, coags, and cardiology consult. He got an EKG, a bedside ultrasound and lasix. And he got better. And he was grateful.” Residents are working within fragmented healthcare systems with very limited resources and frequently find that basic health education is the most useful skill they have to offer. Dr. Luke Husby and Dr. Leslie Osborn noted about their time providing care in mobile clinics in Samoa; “All in all we held 6 clinics and saw over 1200 patients, dozens of which ended up hospitalized for various injuries or illnesses and at least one woman was rescued from an abusive situation. A great deal of education through pharmacy, wound care, nurses, the Christian based team, and the practitioners was probably the longest lasting effect we had, although whenever possible the positively screened patients were able to be referred to local physicians.” Although practicing in these environments can be frustrating, such experiences give residents a new perspective and a renewed sense of what it means to be a physician. Thank you to Palmetto Health for seeing the value global health experiences have in resident education and patient outcomes in some of the poorest regions of the world. April 7th marks the twenty-year anniversary of the Rwandan Genocide. 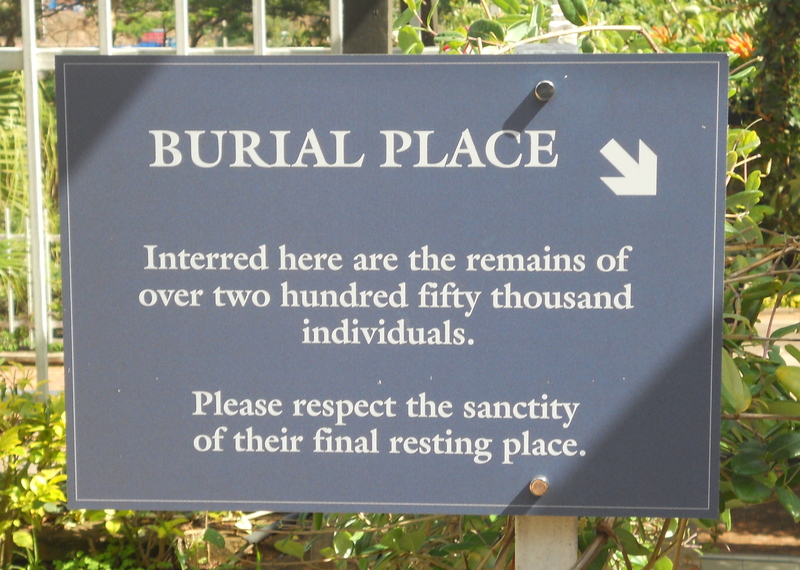 In a 90 day period, nearly 1 million Rwandans were murdered, mostly those of the Tutsi ethnic group. To put things in perspective, imagine the entire population of Miami and Atlanta obliterated between now and July 4th. Ninety days of complete horror where neighbors killed neighbors, children killed children, and some watched virtually every single person they knew slaughtered before their eyes. Ninety days where the concept of humanity was suspended and all that mattered was the ethnicity printed on a person’s ID card. Walking down the streets of Kigali today it’s nearly impossible to imagine the carnage these streets saw in 1994. On the surface, Rwanda has healed well. Despite the substantial morbidity and mortality the genocide inflicted on the country, Rwanda ranks above the African regional average in literacy and access to clean water and sanitation, and has lower levels of child and maternal mortality, as well as HIV prevalence. This is an amazing feat considering the strain that complex humanitarian emergencies like the genocide place on an already crippled economy and government, not to mention the extreme loss of human resources due to mortality and displaced populations. Certainly the influx of a massive amount of aid from a guilt-stricken international community (which did little to intervene in the genocide) has been key in Rwanda’s significant health gains since the genocide. But let’s give credit where credit is due. Rwanda has prioritized healthcare and invested in an inclusive universal health insurance scheme that has made all the difference. The country has become a shining example of how international aid dollars can lead to huge health gains. A nationwide anti-corruption campaign has insured that those dollars are put to their intended use and Rwanda continues to decrease its dependency on foreign aid. There remains one major shortcoming in Rwanda’s road to recovery. It’s the elephant in the room – mental health. Always neglected, always underfunded, it’s difficult to provide appropriate mental health treatment to many patients in even the wealthiest countries in the world. But if ever there was a country in need of better mental health services, it has to be Rwanda. I have personally only spent a short period of time in Rwanda and was amazed by the resiliency of the genocide survivors. My taxi driver pointed out the lake his parents were drowned in during the genocide. The young physicians I worked with in a rural town described growing up in a refuge camp just over the border in the Congo. The camp is still there and you can see it on the horizon from the hospital where they work. Everyone is relieving the genocide. Everyday. Statistics on prevalence of post-traumatic stress disorder, depression, and suicide rates in Rwanda are hard to come by. Even more difficult is measuring the impact on quality of life and disability such mental health issues can cause. Recently more attention has been placed on mental health in Rwanda with the NGO, Partner’s in Health partnering with the Ministry of Health to ramp up training for more mental health practitioners. Improvement, but still a long way to go. These are the moments that make you question yourself. Eight years of higher education, three to four years of specialty training, and a mound of debt…for this? As a young emergency medicine physician with only a few years out of residency training, I have to admit that I am afraid. There is not a week that goes by that I don’t experience this three a.m. reality check. I have thirty some odd years left to practice and I already have seeds of bitterness and frustration growing inside me. How will I be able to do this job in ten or twenty years? And more importantly, what will this job do to me? There has to be something else. Enter Global Health. In recent years, more and more physicians are getting involved in global health projects. Emergency Medicine Physicians in particular, seem to be increasingly drawn to these types of projects and there are now more than thirty international emergency medicine fellowships. The appeal of global health to emergency medicine physicians is not surprising. The diverse skill mix of emergency medicine translates nicely into the international setting and acute care training is lacking in most low-resource settings, creating a much-needed niche. But more importantly, global health projects are filling a gap in the satisfaction department that our regular ER jobs seem to leave behind. The reason for this is simple. Global health projects take all the reasons we went into emergency medicine in the first place and magnifies them by a thousand. ER docs like to take care of sick people. I recently worked a twelve hour shift at home where I saw about three patients an hour and did not admit a single patient. The last time I worked an ER shift in Haiti the healthiest person I saw all day (and the only patient that was discharged) was a five year old with a broken arm. It’s refreshing to feel like it mattered that you showed up to work on a particular day. And don’t get me wrong, we absolutely make a difference and save lives working in the emergency departments of the developed world…it just often doesn’t feel that way. The inherent gratification of our job gets buried under a pile of impatient fast track patients, piles of medical-legal driven documentation, abuses of the system, and bad Press Ganey scores. Oh, and did I mention that in the developing world there are very few, if any of those things? Care is documented so that there is a record of the patient’s care, not so you can defend yourself in court in the event of a lawsuit. People will walk for miles and stand in line for days to see a doctor. Of course not everyone in the developing world is satisfied with his or her care, but there is an overall level of gratitude that I rarely experience in the United States. But what amazes me most about participating in global health projects is the positive effect it has on my patients back home. After a few weeks working in a low-resource country, the three a.m. dental pain coming by ambulance doesn’t bother me so much. I am able to treat my patients with more kindness and patience. Instead of seeing a waste of resources, I see an opportunity to educate. It’s all about perspective and global health has given that to me.